"She was a bright star and still is"
A D.C. musician who was killed in a horrific crash along Suitland Parkway was laid to rest Friday. 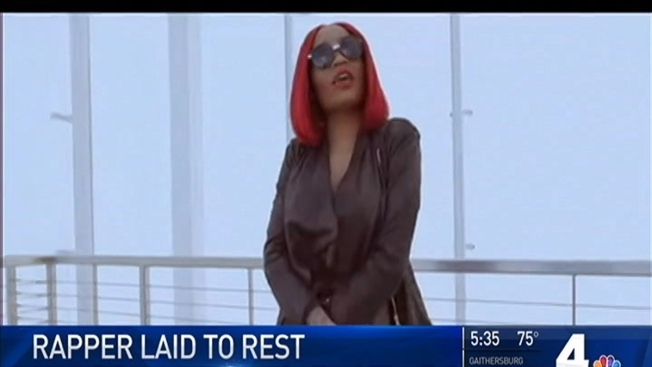 The young rapper and singer Dasia Lasha'e Redd, who performed under the names London Dior and Lundy, was memorialized at The Way of The Cross Church of Christ International in Capitol Heights, Maryland. Friends and family wore white as they celebrated her spirit. "She was a bright star and still is," friend Steven Douglass said. Redd, of Southeast D.C., had gained national attention and had big dreams. "Her mom said she was her little star, ever since she was a little baby. That's what she wanted to be," Dior's grandmother April Epps said. Redd and two other people were killed about 4 a.m. May 15 in a crash involving a sedan and a Jeep on Suitland Parkway, near the intersection with Forestville Road. She was 20. The sedan caught fire, officials said. Authorities said the three people from the car all were pronounced dead at the scene. The victims were Redd, her boyfriend and another person in the sedan, Dior's family told News4. They had just left a recording studio, where Redd was working on an album, her grandmother said. The driver of the Jeep survived but was seriously injured. In March, a mother and her 2-year-old son were killed in a crash in the same intersection. "The road has acquired a checkered history," said John Townsend, of AAA Mid-Atlantic. Twelve people have died in parkway crashes over the past three years.